You’re hungry, but you don’t want to cook and you want to stay out of the drive thru. When most people find themselves in this predicament, ordering pizza is usually the answer. Unfortunately, when most Americans think of pizza, their only reference point is something from the ubiquitous chains that offer game day specials, with a side of hot wings. We in Las Vegas are lucky, we don’t have to travel to Italy to try some authentic Italian pizza. 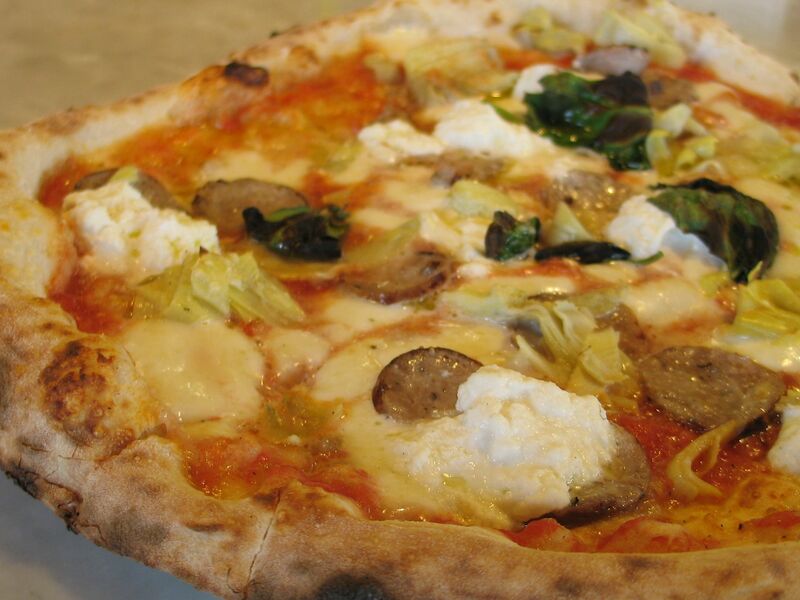 Just head down to Henderson, and visit Settebello Pizzeria Napoletana. Settebello Pizzeria Napoletana is a member of the Vera Pizza Napoletana. When I first visited Settebello, I had no idea what the Vera Pizza Napoletana (VPN) was, all I knew was that I hadn’t tasted pizza like this since I visited Italy. Whether it was the cheese, tomato sauce, dough, or toppings, what I tasted was the true flavor of each ingredient. 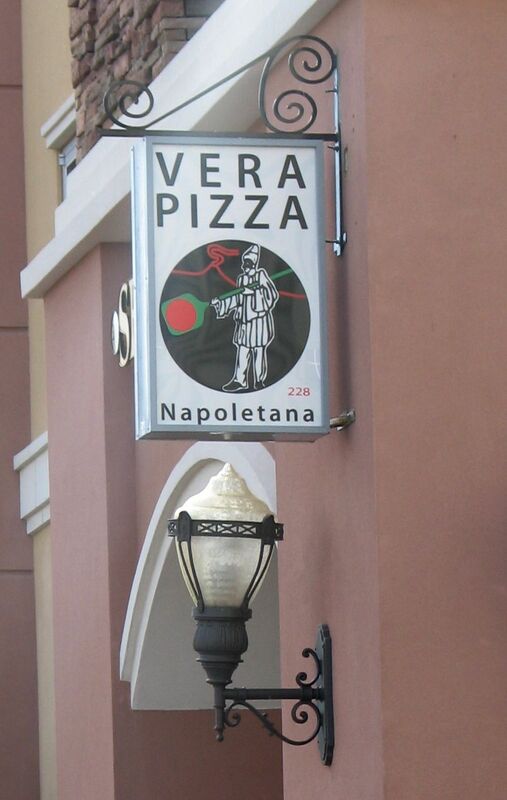 Vera Pizza Napoletana literally means true Neapolitan pizza. VPN was created to protect and defend the art of traditional pizza making as it began in Napoli (Naples) over 200 years ago. The VPN requires VPN certified pizzerias to follow certain standards. Many ingredients come directly from Italy like the crushed San Marzano tomatoes used in the sauce at Settebello. I find that a lot of people don’t like tomatoes and it’s usually because they’ve never tasted a home gown tomato, picked ripe. A good tomato should be more sweet than acidic and full of flavor. 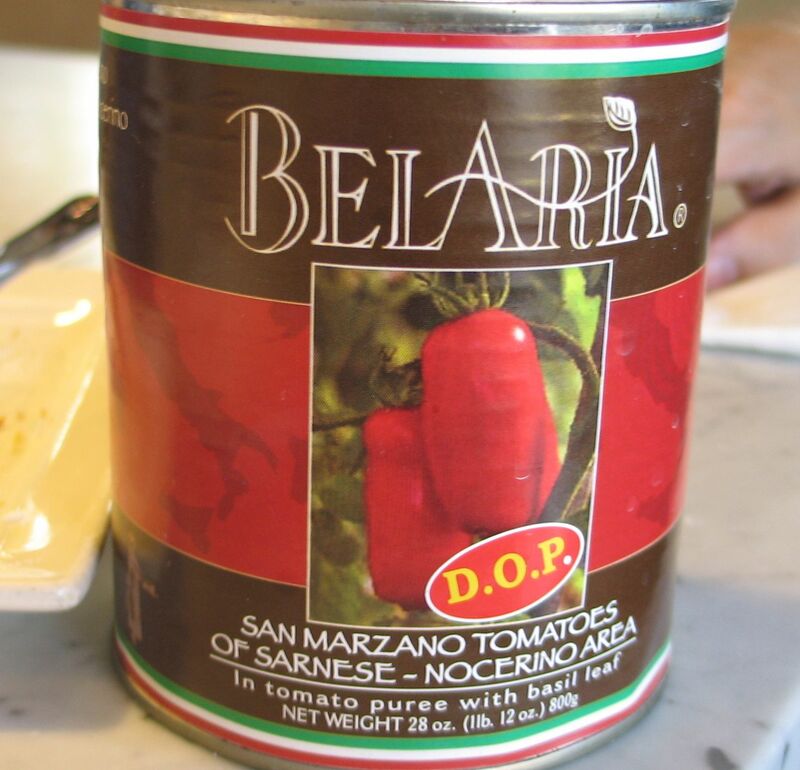 This is the flavor that the San Marzano tomatoes bring to the sauce at Settebello. Settebello also uses fresh milk mozzarella cheese, not the processed mozzarella used on most pizzas. Settebello pizzas are cooked in a wood burning oven at high temperatures, usually for no more than 90 seconds. This, along with chef Carmine D’Amato’s cooking skills, creates a pizza where the cheese has melted to perfection, yet more delicate items like basil are cooked just long enough to bring out the flavor. While I don’t think you can go wrong with any pizza at Settebello, my favorite pizza is the Pizza Lasagna. It’s topped with tomato sauce, mozzarella cheese, wood oven sausage, dollops of ricotta cheese, parmigiano regiano, basil, extra virgin olive oil and mushrooms (on my Pizza Lasagna I like to replace the mushrooms with artichokes). Another favorite of mine at Settebello is the Pizza Bianca or White Pizza. The Pizza Bianca comes with prosciutto crudo, arugula, parmigiano reggiano, and extra virgin olive oil. The Pizza Bianca has no sauce on it, and while I love the flavor of the San Marzano tomatoes, the Pizza Bianca allows you to really taste the clean milky flavor of the fresh mozzarella. As good as the pizzas are at Settebello, if you only have pizza there, you’re doing yourself a disservice. There is a great happy hour menu at the bar. One of my favorite offerings is the Fritta, a calzone filled with prosciutto cotto and fresh mozzarella. The calzone is fried just enough to give the outside a slight crispiness, then it’s topped with those slightly sweet crushed San Marzano tomatoes. 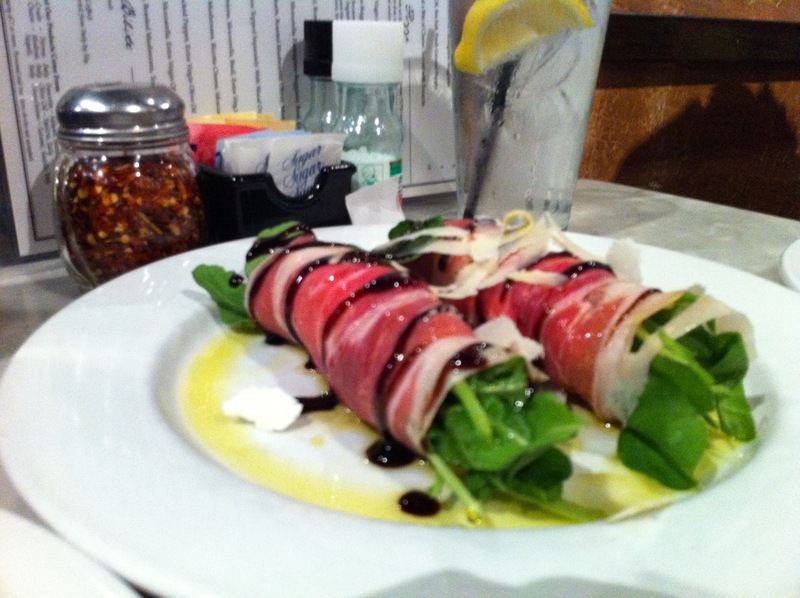 And for a starter, I recommend the Involtini di Prosciutto. Call it a salad if you like, but it’s much more exciting. Involtini means little bundles and that’s exactly what you’ll get, little bundles of baby arugula wrapped up in creamy goat cheese and prosciutto. The bundles are topped with shaved pieces of parmigiano reggiano, then drizzled with a balsamic reduction and extra virgin olive oil. With each bite you get to savor the combination of the peppery, salty and sweet flavors of the ingredient as they come together in the bundle. And last but not least, what would a dinner of true Neapolitan pizza be without homemade gelato for dessert. The next time you want pizza, put down the phone, hop in your car, and head to Henderson for some authentic Neapolitan pizza at Settebello. This entry was posted in Off the Strip, Pizza, Restaurants and tagged arugula, basil, calzone, dessert, gelato, Henderson, Italy, mozzarella, Naples, olive oil, parmigiano reggiano, Pizza, prosciutto cotto, ricotta, San Marzano, Settebello, tomatoes, Vera Pizza Napoletana by greedygirlinlv. Bookmark the permalink. Reading your article brings back the memories. My visit to Settebello was exactly as your described. Now on the east coast and too far away from Henderson and Las Vegas, I wish I was there for another truly delectable pizza and salad. Never thought I would eat the whole thing, but certainly did and without discomfort. First place I got to go when I return. Thanks for bringing those memories home through your words!!! Wow that surprised me that they only cook the pizza for 90 seconds, I would have expected it would have been longer.. especially given it takes a little bit for the pizza to come out after you order it. Maybe they just make you wait for the heck of it. I do like the pizza at Settebello though it’s some of the best in Vegas. I generally prefer American style pizza but the pizza here tastes very authentic and is very light. There is a little bit of a wait for it but they do have to roll out the dough and put all your toppings and stuff on it. They are definitely my favorite even though I do want to check out some of the pizza places you highlight.